Chelsea’s dwindling hopes of a top-four Premier League finish took another hit with this disappointing display against relegation-threatened West Ham at Stamford Bridge. All three points looked to be staying in west London once Cesar Azpilicueta had taken advantage of some sloppy defending at a corner to give the home side the lead late in the first half, but Antonio Conte’s men failed to extend their advantage and paid the price when substitute Javier Hernandez did what he does best and put past Thibaut Courtois with less than 20 minutes remaining. The resulting point could prove vital to David Moyes and his squad come the end of the season, but for Chelsea it was yet another two points lost. Chelsea started the game in their typical 3-4-3 system, with both Eden Hazard and Willian often moving into central positions between the lines to play closely with Alvaro Morata. The width came from wing-backs Victor Moses and Marcos Alonso, with Cesc Fabregas dropping deep to pick up the ball and try to open up West Ham’s low defensive block. 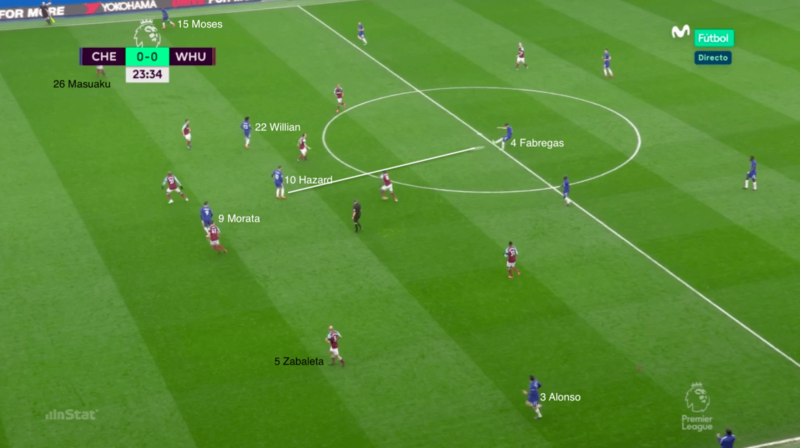 During the early stages of the game, Chelsea succeeded in creating opportunities through Fabregas finding Hazard centrally and then the front three combining to cause the West Ham defensive line problems. 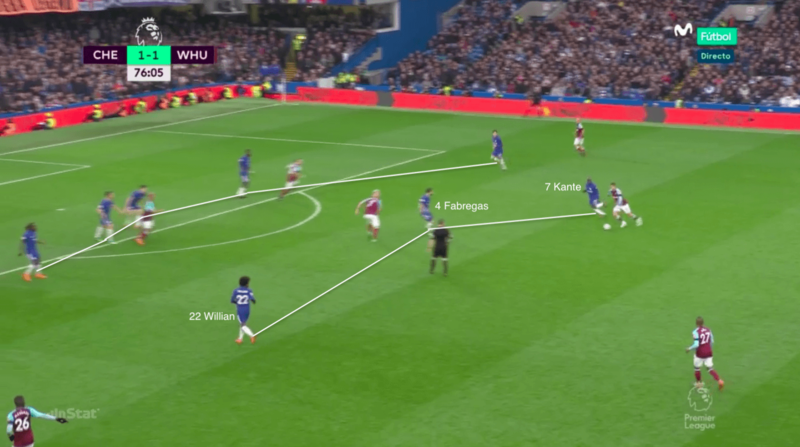 When West Ham were more successful in screening the balls into the front three, Chelsea would switch wide and look to create a crossing opportunity – although they struggled to get numbers in the box, with Morata often a lone presence against the visitors’ back three. West Ham set up with a very low block defensively, but when they did try to threaten a higher press, Chelsea often relinquished the opportunity to play quick passes through the press and opted for a more direct ball to Morata – but the Spaniard found it difficult up against the Hammers’ back three, with Mark Noble often occupying a good position for the second ball. 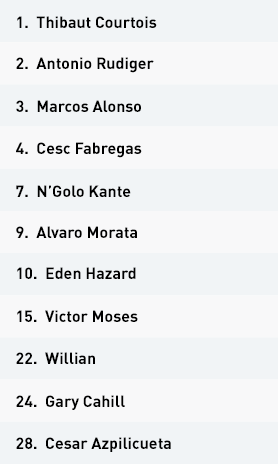 When Chelsea tried to play through the higher press, they looked for Willian or Hazard in good positions to half-turn and attack against a less-established block, with Moses and Alonso always ready to join the attack. 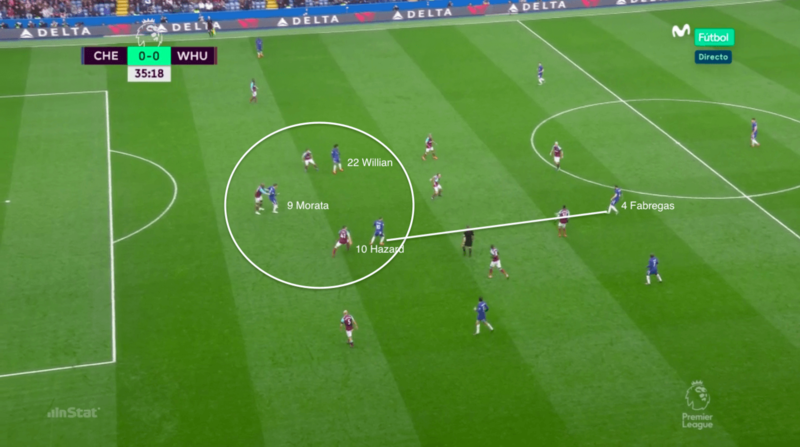 In their offensive transition, Chelsea created good counter-attacking moments by quickly finding Hazard and Willian as key counterpoints with early passes before West Ham dropped into defensive shape. 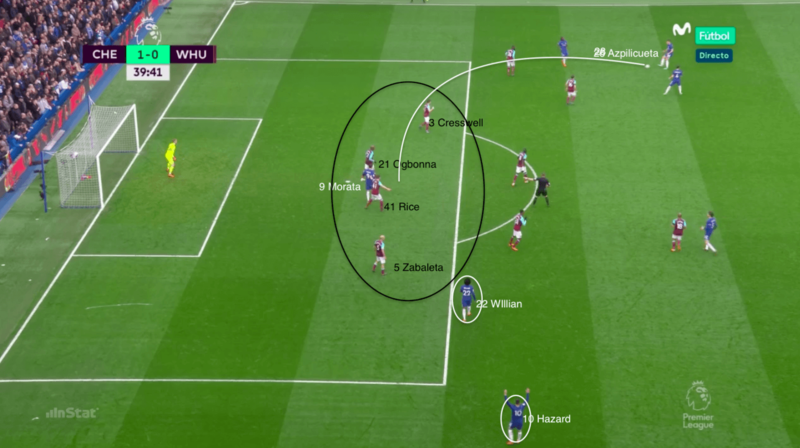 The build-up leading to the Chelsea goal came as a result of excellent link-up play between the front three, with Hazard playing Willian through and winning the corner that led to the goal. 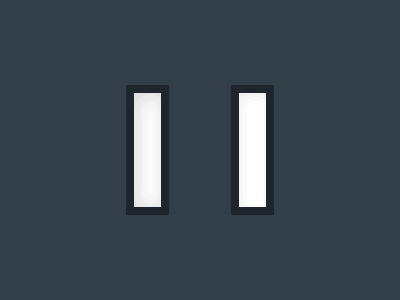 West Ham will be disappointed with the goal, as their zonal defenders weren’t in position early enough and were caught unfocused at the short corner, allowing Azpilicueta to take advantage. Defensively, Chelsea tried to press high with Hazard, Willian and Morata forcing Joe Hart and the West Ham back three to be more direct. 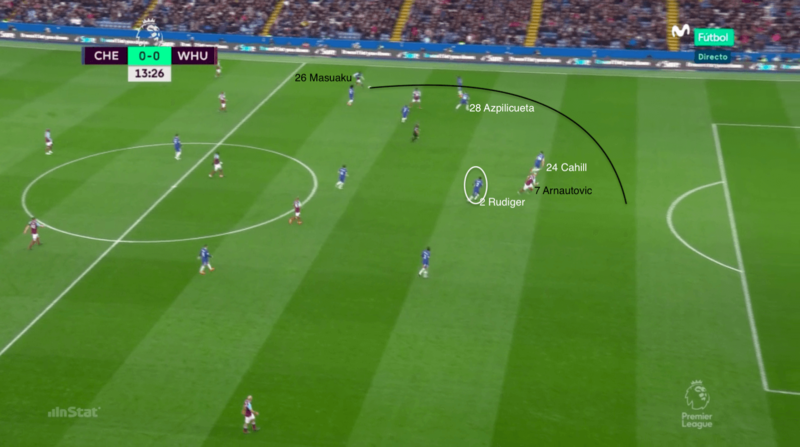 As Chelsea controlled the possession of the game, they weren’t forced low very often – but early in the first half there were signs of miscommunication between the back three, with Marko Arnautovic getting in behind Antonio Rudiger when Gary Cahill dropped early ahead of the rest of the defensive line. West Ham’s late equaliser came from a similar incident, when Azpilicueta and Cahill dropped to protect space but Rudiger didn’t. This allowed Arnautovic to pick up the second ball and play Javier Hernandez in to score. The Chelsea front three play very close, enabling quick one-touch combination play. Here, in the move that leads to the corner from which Chelsea took the lead, Cesc Fabregas finds Eden Hazard, who links with Alvaro Morata while Willian makes a third-man run in the space created by Morata’s movement. The creation of a central three-against-three caused West Ham problems in the first half. West Ham sit with a block of five and four, with space for Fabregas to turn and find a passing line through to Hazard. 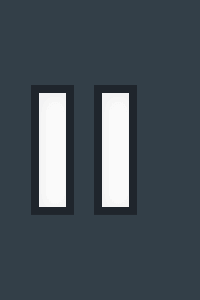 The advanced positions of wing-backs Victor Moses and Marcos Alonso keep their opposite numbers occupied, enabling the front three to play up against the West Ham back three. Chelsea failed to get numbers into the West Ham box when crossing opportunities arose, giving the vistors numerical superiority in the area. Here, Cesar Azpilicueta shapes to cross but has only Morata to aim for against four defenders, with Willian and Hazard outside the box. Not surprisingly, West Ham were comfortable facing crosses. The short corner from which Chelsea took the lead. Marko Arnautovic is not yet back in the zone he should occupy on corners, while Edimilson Fernandes is not picking up Azpilicueta early in the set-piece phase. 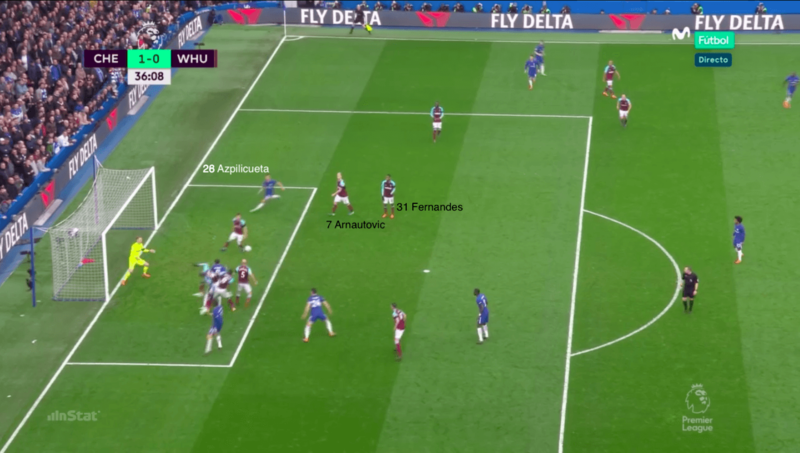 The second phase of the set-piece, where both Arnautovic and Fernandes have been caught out of position and Azpilicueta is left alone to score. West Ham’s low defensive block, with the back line sat low on the edge of their 18-yard box and the midfield four sitting in front. Mark Noble and Cheikhou Kouyate are positioned low to prevent space between the lines, while lone striker Arnautovic is also very low. As a result, the transition from low block to established attacking play was a challenge for West Ham. 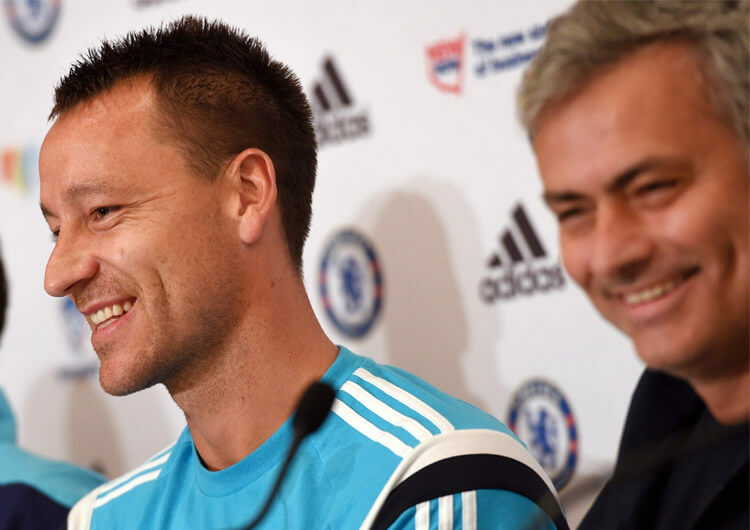 Chelsea employed a high press from the start. 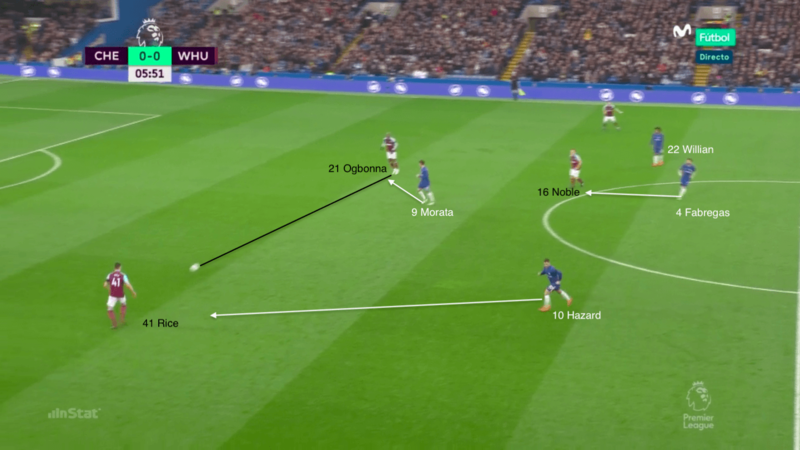 The horizontal pass from Angelo Ogbonna to Declan Rice is a trigger for Hazard to press. Alonso locks on to Zabaleta and Fabregas locks on to Noble. This prevents short passing opportunities and West Ham are forced to play long to Arnautovic. West Ham were able to take advantage of imbalances in the Chelsea back line. Here, Arthur Masuaku has the ball without any pressure on the pass. 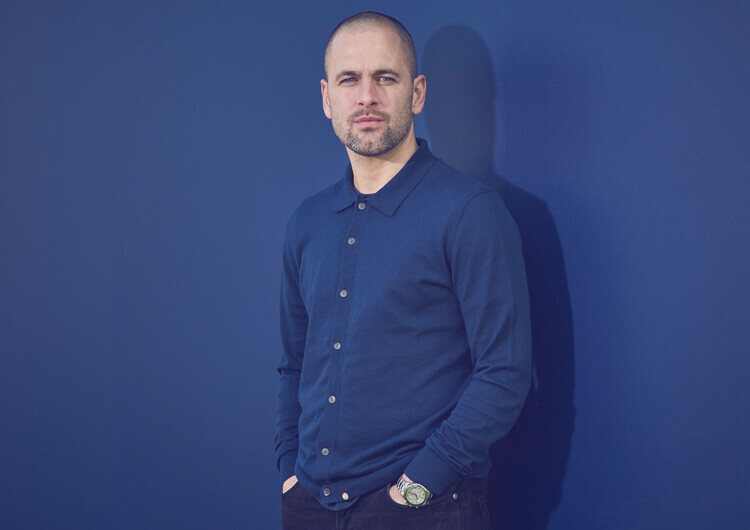 Gary Cahill drops early to cover the space in behind, but Antonio Rudiger holds the line higher, allowing Arnautovic to get in behind off the shoulder of Cahill. The phase of play leading to the West Ham goal. 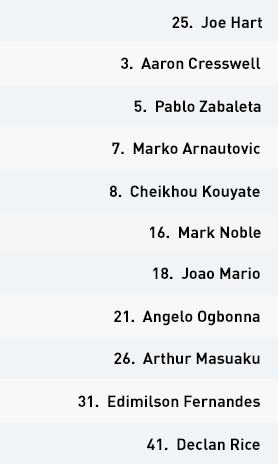 Arnautovic and Kouyate make runs in behind, Noble plays the ball in towards Arnautovic. Cahill and Azpilicueta drop with the run, but Rudiger stays high. Arnautovic picks up the second ball in the space behind Rudiger, before setting it back for substitute Javier Hernandez to score. 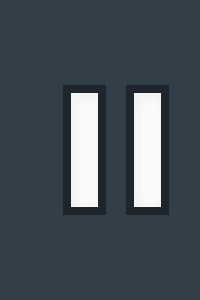 Chelsea’s counter-pressing possibilities. After a sustained period of possession West Ham are extremely low, with their front three of Arnautovic, Fernandes and Joao Mario very low and in no position to create a counter-attack. N’Golo Kante and Willian have an opportunity to counter-press, but instead they drop and allow West Ham to establish their attacking shape. In the defensive phase, Chelsea can drop back into a 5-3-2, with Willian joining Kante and Fabregas in a midfield three. Eden Hazard is given licence to stay higher up the pitch, and look for space that could help his team in their attacking transition. West Ham spent the majority of the game in a 5-4-1 formation with a very low defensive block. 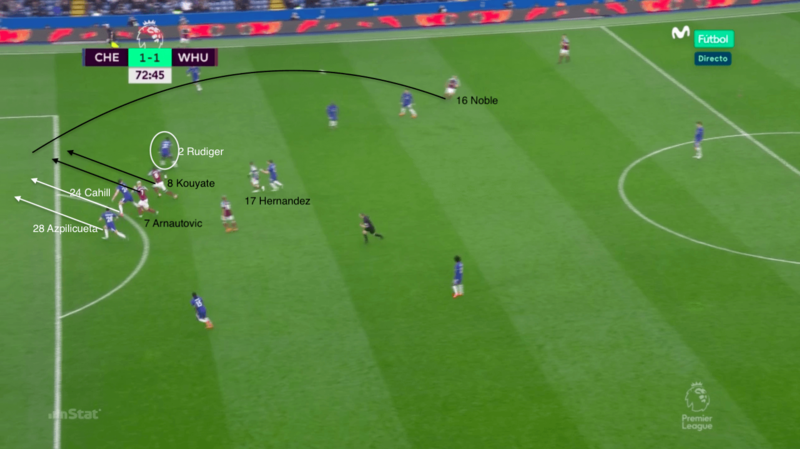 Their game plan showed an awareness of Chelsea’s threats, especially in central areas, and captain Mark Noble worked hard to screen the passes into the half spaces. However, several times in the first half, after Chelsea moved the ball quickly into Cesc Fabregas, he found a passing line into the half-space for Eden Hazard or Willian. Because of the high positions of Victor Moses and Marcos Alonso, the West Ham wing-backs were occupied. This meant the breaking of the West Ham midfield line created three-versus-three situations in which the visitors’ back three were isolated against the clever Chelsea front three. They defended well from crosses, however, and were more comfortable when Chelsea played outside them, with the three central defenders holding their line and position well in front of the goal. West Ham struggled in the attacking transition in the first half, as their front three of Marko Arnautovic, Joao Mario and Edimilson Fernandes were very low. It was thus very difficult to create opportunities to move up the field effectively after regaining possession. When they did get a chance to press higher on to Chelsea’s build, they dealt well with the long ball to Alvaro Morata, with Noble always occupying a good position to pick up the second balls. In the second half, the introduction of Javier Hernandez had an immediate impact, with him scoring the visitors’ equaliser from an Arnautovic assist. The Mexican forward occupied positions closer to his strike partner, allowing West Ham to play higher and retain the ball in Chelsea’s half. They dealt with Chelsea’s late pressure well, defending the box extremely well and Joe Hart making some significant saves.  On the few occasions that West Ham could establish possession and force Chelsea’s block lower, the hosts struggled to pressure the player on the ball or deal with good runs from Arnautovic and Joao Mario in the final third. At different times, both Arthur Masuaku and Noble found themselves under little pressure and with time to play their forwards in behind. 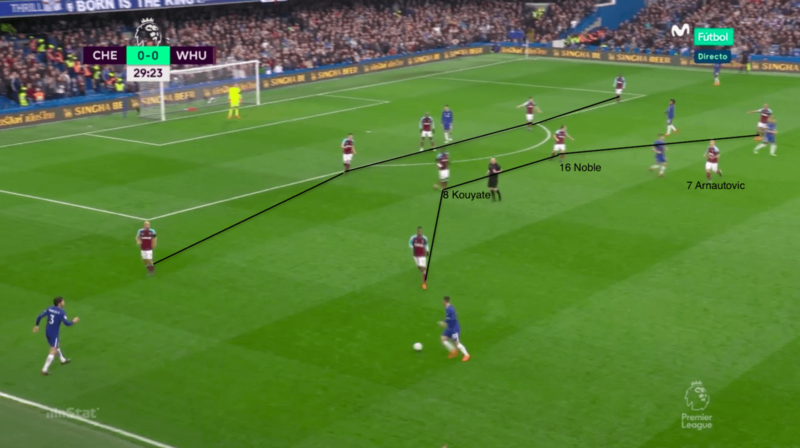 Noble was an influential figure throughout the game, not just without the ball – for his ability to screen and pick up second balls – but also in offering short passes through Chelsea’s press to establish his team in an attacking sense. He switches the point of attack well and, together with Cheikhou Kouyate, was important to West Ham getting a point from the game. In addition, it was positive for West Ham to see another stable performance from Declan Rice, who coped well with a lot of clever movement from Chelsea’s front line and dealt with a lot of applied pressure and balls into the box late in the game. Chelsea dominated possession but at times seemed reluctant to risk too many numbers going forward, particularly when they were able to get crosses in from wide areas. They had several opportunities to counter-press more aggressively after losing the ball in West Ham’s defending third, but were slow on the first pressure and allowed the visitors to get further up the pitch than they could have done. The West Ham game plan was built on a tight and low defensive block that tried to deny space to the Chelsea front three in central areas, although the advanced positions of the Chelsea wing-backs meant that when Cesc Fabregas was allowed time and space to pass through the midfield line, the back three were isolated against the hosts’ dangerous front three. The Hammers were more comfortable defending balls into their box from wide areas. The second-half introduction by David Moyes of Javier Hernandez had an immediate impact, as the Mexican could get closer to Marko Arnautovic and help his team get higher up the pitch more often. 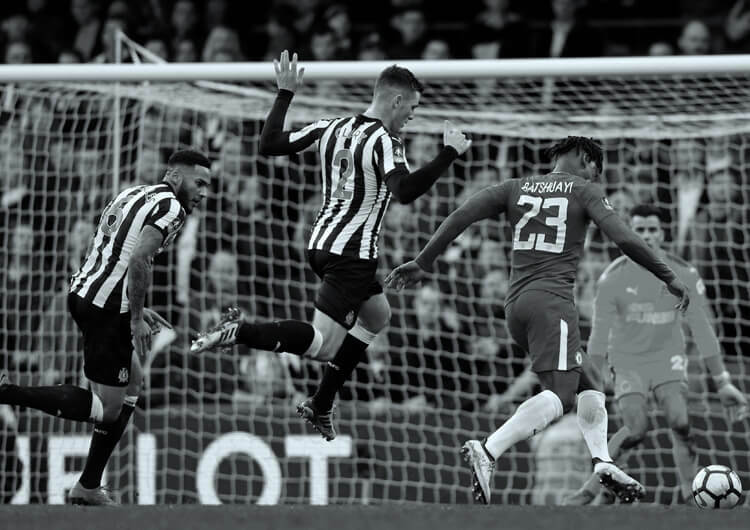 He also scored the equaliser, which was partly the result of an imbalance in the Chelsea back three that had already been noted in the first half, when Gary Cahill dropped in and Antonio Rudiger held the line.